This being called the first teaser for the film and it's not, we actually reported on the promo reel back in June, but now the website is live with posters and the teaser has some new footage. 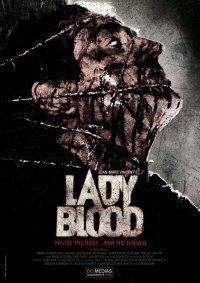 This is a sequel to the 1990 film Baby Blood, and it's taken a while to come around, because apparently (or so a little birdy told me) they were having some problems. "Several years after a terrifying and traumatic experience, Yanka has to face her old demons again. She has become a mom, a wife and a police inspector. Meanwhile some mobsters have arrived in town, many ravaged bodies are found. Is there a link? But the serial killer seems to be a cannibal and the bodies have evil marks. Yanka has a strange feelingâ€¦ Definitely, something has come back, something is approaching, something is looking for herâ€¦ This time she is not alone, but will her family or her police team be able to save her?" The world premier will be November 5th at the AFM and you can head over to the official website for the new teaser.